A couple of pieces of site business: First, Alicorn Priest, please e-mail me about your guest post. You should be able to find my e-mail by clicking on my name at the bottom of this post; if not, it’s hidden deep within the comment policy, which is linked to the right. Second, this is the last new post by me this month. I am burnt out on ponies and need a break, and the near-simultaneous end of the third season of reviews and the fourth season of broadcast seems the perfect place to do it. I will still have pony articles every Sunday, but they will be either guest posts or book versions of Season One articles. Which brings me to the third item: I need guest posts! Please send ’em if you’ve got ’em! Anything within the general scope of thinky things re: My Little Pony is fair game. Finally: Spoiler warning. In the course of writing this article I think I realized What’s In The Box. I do not explicitly state it in the article, but it’s fairly easy to figure out if you follow the article’s logic and extend it out through Season Four. So you may want to wait to read this for a week. no foreshadowing at all. We’ll find out in a week! Though much has faded with the generally glowing reception of Season Four, there was and to an extent still is some contention regarding this episode, most of it centered on varying reactions to Twilight’s apparently sudden ascension to what seems to be a position of leadership. Although I am firmly in the camp of adoring this episode, I shall endeavor to treat the “con” position (which will hopefully get a full airing in a guest post soon) with a measure of charity. Most of this episode’s critics are, after all, engaged in that most time-honored of geek activities, ritualized hatred as a demonstration of devotion. (Yeah, I failed to last even one sentence treating them with the promised compassion.) But at the core of this complaint is a fundamental optimism. To posit that the show is risking losing some essential part of itself in search of new toys to sell is to suggest that at some point this twenty-two-minute toy commercial had, and therefore conceivably could still have, integrity. Ultimately, the fear here is that the show faces a loss of integrity due to the (fairly obvious in the latter half of Season Three) lack of leadership, and therefore lack of anyone able to stand up to toy demands by Hasbro. The two episodes prior to this were effectively a two-parter about the Mane Six, reduced to utter fecklessness, making a hash of a major event while a greedy creature tried to scam them behind their backs, without them ever noticing; certainly there is some call for restraining any excessive optimism. 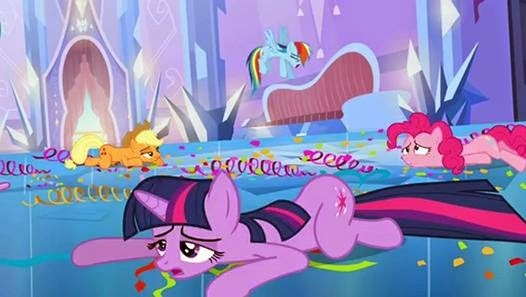 But on the other hand, if we extend to the episode the basic charity of not assuming that our perceptions are reality, that an unexpected change is necessarily a sudden change, what emerges is a very fun, musically outstanding episode that explores both Twilight’s compassion for her friends in need, and how she has helped to inspire their devotion. Notably, that devotion is not to her–at least not the devotion that matters, which is to each other. Starswirl the Bearded’s mangled spell undermines the integrity of the identity of each (Twilight excluded) of the Mane Six. Twilight’s (rather brilliant) solution is not to restore their memories (and thereby destinies, the past being what defines the future) and true selves, but rather to exploit their compassion for each other to get the “right” pony for each job to do that job. 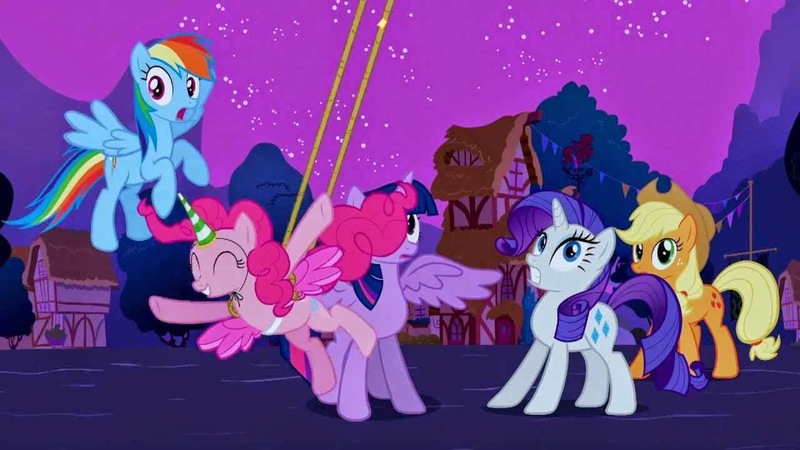 Each of the ponies in turn takes over leadership of the group (and song) while nudging the next pony in line to, as an act of charity rather than a part of their identity, help the pony after that with a task that is rightly the middle pony’s specialty. A mite confusing written out, but straightforward enough of a pattern in the episode; it is the relatively old idea sometimes stated as “pass it on”; that is, doing something for others not in hopes of a return for oneself, but in the hopes that they will elect to do good for still others, demonstrating once against that perhaps the greatest enemy of capitalism (which would necessarily include toy companies that view artistic creation as part of a marketing strategy) is optimism. It may seem curious to keep talking about the fundamental optimism of an episode which posits Ponyville effectively falling apart without the devotion of the Mane Six. Most disturbing is that the ponies of Ponyville are apparently unable to maintain a civil society without the constant amusement provided by Pinkie Pie (which has always been an act of charity), to the point that this appears to be a more immediately upsetting loss than the imminent collapse of the town’s first business and producer of its main exports, Sweet Apple Acres. This is where more negative fans might point to the lack of integrity in Season Three, in the original sense of the word: it simply does not hold together tonally or fit in well with the established continuity of the show or the kinds of stories it was created to tell. Are the Mane Six, we start to worry, depicted as being so important just because they’re the main characters–are we, in other words, headed down a road where the majority of ponies are not fully real the way the main characters are, in direct contradiction to Lesson Zero and the necessity of recognizing other persons as other and as persons? Happily, not necessarily; it is equally possible to trace the path by which all of the Mane Six, even (especially!) Pinkie Pie, have slipped into positions of community leadership not solely because of their adventures or their abilities or even because of their status as main characters, but because when they see a problem they immediately move in to offer help–from the heroic to the mundane, all united as an expression of pure compassion. Said compassion alone, however, is not enough; that really would be an excess of optimism! Far more is required, and to understand precisely what, we need to go back to the first time one of the Mane Six volunteered themselves into a position of leadership over more than just the Mane Six themselves. I refer, of course, to “Winter Wrap-Up,” the beginning of the most profound period of change in the development of the show, the first of the four episode stretch over which it exorcised its own false destinies and sprouted its own wings and horn, if you will. The transformation of Twilight Sparkle in this episode is tremendous; remember that her early character was defined almost entirely by devotion–to Celestia, to her studies, to her new friends–and that she thus came across very much as the stock character of the bookish, intelligent, socially awkward “nerd girl.” If, then, we are to point at episodes which violated the integrity of the show and Twilight’s character, we must look not at the episode where the character who could already cast spells enabling her to walk on clouds, teleport, and grow wings went on to grow some wings, but rather at the episode where the bookish awkward girl metamorphosed (ultimately permanently, though that was not obvious at the time) into the organizational maven and de facto ruler of Ponyville as a result of what amounts to a single act of charity. But I do not actually advocate, as a general rule, looking at episodes without at least attempting charity. In both that episode and this Twilight’s biggest concern, as it has generally consistently been, was compassion; she was upset less at being left out and more at being unable to help, though admittedly at least part of that was because her inability to help activated her underlying insecurity. Nonetheless there is a clear thread of continuity running through the character of Twilight Sparkle. (It is, perhaps, more debatable whether there is such a thread running through the episode. One of the most prominent complaints about the episode is its lack of internal integrity; the argument is that it is rushed, that it falls into two distinct halves that could have made a two-parter. This is nonsense, and I’ll discuss why in a few paragraphs.) Consider again the method by which she helps her friends restore their memories and selves in this episode, by getting them to help each other. It is no accident that this accomplishment–and the ensuing surge of shared joy and optimism–is what triggered Twilight’s apatheosic ascension. As I said, she was a character defined by devotion to her studies, defining her identity as Princess Celestia’s student. From there, by means of the route opened by “Winter Wrap-Up,” she evolved over the course of the second season into someone who could help others to learn (one old, and still somewhat current in Britain, definition of “Master”)–in essence, the second and third seasons are her graduate coursework. Now she is a step beyond that, doing the same thing Celestia did to her in “Return of Harmony” by mailing back the friendship lessons: Teaching others how to teach (one way to understand the nature of a professorship). But her subject of study has been the fundamental building blocks of society itself; is it any wonder that what the spell actually does–which, if you pay attention to the wording of Twilight’s version, is a direct contradiction to Starswirl’s “one alone” formulation, combining the destinies of many into a single focal point–is turn the caster into a ruler? Isn’t organizing others to help one another and themselves, precisely what Twilight has specialized in since “Winter Wrap-Up,” the very essence of leadership? And so it is, her life’s work done, her goal achieved, Twilight Sparkle dies. nothing to it; it is absolute perfection. I bow to its glory. It’s January 26, 2013. The top song is still Bruno Mars’ “Locked Out of Heaven,” thankfully on its last week, and the top movie is Hansel and Gretel: Witch Hunters, which I haven’t seen on the grounds that movies with titles that interesting rarely live up to them. In the news, the annual World Economic Forum begins, where the world’s major political and business leaders meet to solve all the worlds problems, if by “solve” you mean “accomplish very little” and by “all the world’s problems” you mean “as defined by the most successful international corporations”; European scientists successfully use DNA as a data storage medium, which as far as gimmicks go is a pretty nifty one; and, continuing the national policy of punishing the people who report horrific government crimes as opposed to the people who perpetrate them, CIA agent John Kiriakou is sentenced to 30 months in prison for revealing details of the U.S. use of waterboarding to torture prisoners. Meanwhile, in ponies we have “Just for Sidekicks,” written by Corey Powell and directed by James Wootton. Which is the second Spike-centric episode in three episodes, contains little to no presence of the Mane Six, and is the third consecutive episode to be, well, kind of not-good. There’s almost an interesting structural trick being played across this and the next episode, in that this is a sort of “B side” to “Games Ponies Play”: the two episodes take place simultaneously, following different characters, and the climax of this episode puts its characters in the same physical space as teh “Games Ponies Play” characters. Unfortunately, neither episode does much of interest with that structure, they have little to nothing in the way of thematic links, and are both fairly terrible episodes, so the structural experiment cannot be regarded as a success. No, this is yet another sitcom flail, in this case the hoary old “character takes on a new job they think will be easy, fails miserably” story. Indeed, like “A Dog and Pony Show” before it, this is an episode-length reference to a classic folktale, “The Man Who Does His Wife’s Work,” tale type 1408 in the Aarne-Thompson-Uther index. In that tale, a man insists that his wife’s work is easier than his, so they trade for a day. He then proceeds to make an utter mess of a number of household tasks, notably including cooking and taking care of animals, just as Spike does in this episode (though, obviously, the impetus for him doing so is very different). That this story is sexist should be fairly obvious, but note that it is as much or more harmful to women as men, despite that it depicts a man as a bumbling fool when confronted with “women’s work.” The problem is that it defines as “women’s work”–the is, tasks which women must do because only women can be good at them–vitally important support tasks which are done at home for no pay, while men must “reluctantly” therefore take on the burden of all the tasks which require going out into the world and earning money. While our society does allow women to work outside the home and earn money, our entertainment (particularly sitcoms and romantic comedies) still quite frequently depicts men as incompetent at household chores, and it shows. Women still do the bulk of housework, even though they are now working outside the home as well, and while married men (on average) live longer and earn more than unmarried men, women see no such benefit. So, once again we have a sexist traditional folktale, which retains a toxic power in the present day, being used as the basis for a Spike episode. 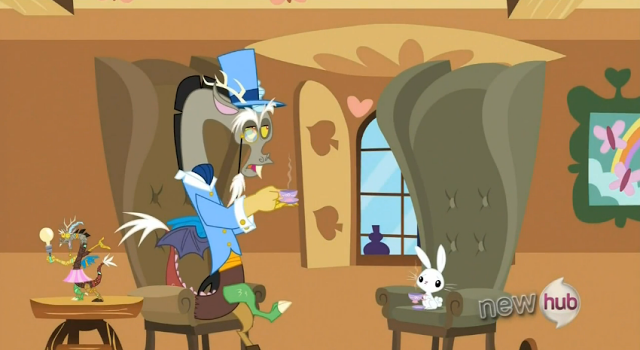 However, we also have a significant callback to a second-season Spike episode, “The Secret of My Excess.” More accurately, we have a significant lack of callback which, in its own way, is a callback. In that episode, Spike’s greed, a traditional defining trait of the European dragon, causes him to begin transforming into a gigantic monster. In this episode, even though his greed makes him unable to stop eating gems long enough to finish his cake, and drives him to graspingly attempt to scam his friends into paying him to do a job he has no intention of doing, his size remains unchanged. Spike wishes to acquire gems, and he sees running a business as a way to do it. However, he doesn’t want to expend any effort; he wants to gain without losing anything–he wants to take out more than he puts in, which is of course the definition of profit. A naive construction of capitalism can be stated as such: In Idealized Econ 101 Land (next door to the universe where hockey rinks are frictionless and cows are spheres of uniform density), A is good at procuring fresh water and less good at raising food; B is good at raising food and less good at procuring water. (It does not actually matter which is better than the other at each task–even if B is better than A at both, it is still more efficient for each to specialize in their personal top skill.) A gets the water and B grows the food, and they trade with each other. Both get more food and more water than if they’d tried to do everything independently; everyone profits. In reality, what happens is that the one who is more ruthless or has an initial resource advantage establishes themselves as the employer, and the other as the employee, which is to say a hierarchy forms in which one has power and the other is subservient. For example, A realizes that zie can go longer without water than B can go without food, and zie takes advantage of that to force B to work for hir. A claims ownership of both the food and the water, and B is an employee (or, given that this example suggests a pre-industrial world, a slave or serf). Thus, while in theory it is possible for profit to be mutual, in practice it is usually a mechanism by which entities with power acquire more. And Spike here is interested purely in profit, at the expense of his customers (who are, ostensibly, his friends) and the animals with whose care he is being entrusted. In this respect, he is once again a perfect match for a real-world corporation. Thanks to Dodge v. Ford Motor Company (a 1916 Michigan Supreme Court case which stands alongside such gems as Plessy v. Ferguson and Citizens United as being among the worst and most destructive decisions by American courts), corporations face a legal requirement to maximize shareholder returns (that is, profitability for the investors) rather than productivity or the good of customers, workers, or the community–or at least, such is the usual public understanding of the case. The reality is slightly more complicated, since while it establishes that corporations have a duty to maximize their shareholders’ profits, it also establishes a fairly stringent burden of proof on the plaintiff to demonstrate that the directors of the corporation have violated the business judgment rule, which has little to do with maximizing profits. Regardless of the extent to which that particular court case is to blame, modern corporations do by and large exist to make money, with employing workers and serving customers treated as an unfortunate obstacle to that goal, to be overcome as quickly and with as little expenditure as possible. (Again, this is not to say that any given employee behaves this way–many individual employees care about their customers, and some managers and even the occasional executive care about their employees. Rather, this is a description of the behavior of the organization as a gestalt entity.) This is precisely how Spike operates throughout the episode, bemoaning the loss of every gem even as he dismissively ignores the advice and requests of the Mane Six and repeatedly tries to find the minimal-effort, minimal-cost way to make sure that the pets are still more or less intact when their owners return. Perhaps the most telling scene is when he recruits the Cutie Mark Crusaders to help him. In persuading them to work essentially for free (the gem he provides them is to pay for the supplies they need to take care of the pets, not any sort of wage for the CMC themselves), he suggests that they might earn a cutie mark. In other words, he persuades them to do unpaid labor for them by promising that it will be educational for them and implying a future career that he has no intent of actually helping them attain. This is an increasingly common scam in the real world, particularly against young people in the creative professions. Designers and illustrators are promised “exposure” for their work or encouraged to enter contests where only the winner gets paid, but all the entries become property of the contest owner; meanwhile, news and review websites such as Huffington Post, USA Today, and The Mary Sue, among many, many others recruit eager young writers desperate to get their foot in the door, publishing their work and earning ad revenue from it, but never paying the writers a dime. In both cases, the effect is to devalue the work; writers and illustrators seeking to get paid for their work find themselves competing against the victims of these scams, and it is nigh-impossible to compete against someone willing to work for free. Essentially, these corporations are tricking their workers into screwing themselves out of ever getting paid, precisely by promising that if they do well enough they might someday get paid. Fortunately, this is Equestria, which is to say a brighter, happier world than our own, and so Spike does not end up (as he would in real life) a successful entrepreneur with sufficient wealth to distort both the political and economic systems in his favor. Instead, he is punished for his attempt to take out more than he put in by, ultimately, being forced to put in far more effort than he intended, and end up with nothing to show for it. Unfortunately, as usual he appears to have learned nothing in the end, as he once again eats his gem before he can put it in the cake. Then again, doing awful things and learning nothing in the process is the norm for Spike episodes by this point. Next week: The even worse “A” side. Spike the Dragon. Messes made, feelings ignored. Ask about our discount creepy clinging plan! In ponies, we have “Spike at Your Service,” with story by Dave Polsky, teleplay by Merriwether Williams, and direction by James Wootton, and normally at this point I’d start talking about how this is yet another episode where Spike is entirely self-centered, places his needs in front of everyone else’s, depicts himself as a victim, and ultimately learns nothing. All of which is true, but boring. Instead, consider this episode in light of the previous Spike-centric episode, “Dragon Quest.” In that episode, Spike more or less rejected his draconic heritage. He still identifies as a dragon, but prefers associating with ponies, and wishes to continue with the pony lifestyle in which he was raised. Most importantly, he has rejected the values and culture of the dragons and embraced the values and culture of ponies, even while continuing to assert that he is a dragon. This necessarily involves some adaptation; Spike is a different species, and cannot live entirely like a pony. He will never get a cutie mark, for example, and while he clearly does have magic (being able to send messages by burning them, for instance), it fits into none of the normal pony categories. Spike must therefore adapt the pony lifestyle to suit himself, while also to some extent adapting himself to fit into the pony culture. 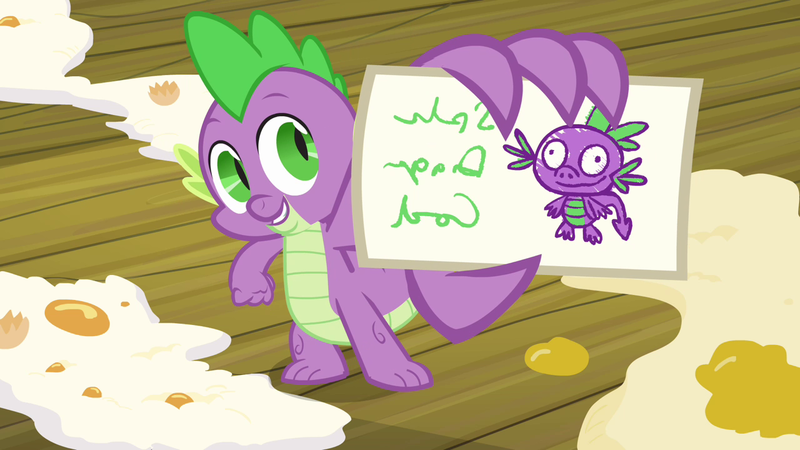 Thus the “Spike the Dragon Code,” an attempt by Spike to construct a moral schema that can serve as a guide to his behavior as a dragon within pony society. This code bears no relation to the behavior of the dragons we see elsewhere in the series, because it is purely Spike’s invention, and based on what he knows best, individual service. 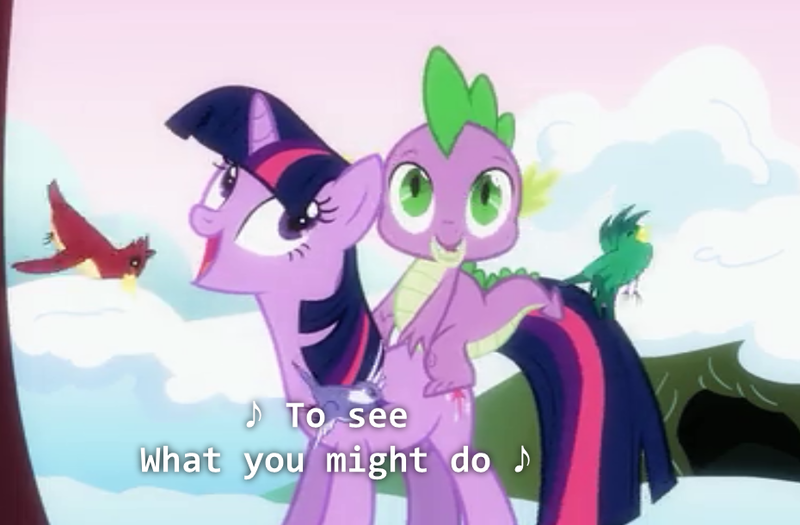 Like “Owl’s Well That Ends Well,” this episode hovers on the edge of the uncomfortably problematic nature of Spike’s relationship with Twilight Sparkle. While character ages are difficult to nail down in this series, Applejack’s flashback in “The Cutie Mark Chronicles” has Bic Mac and Granny Smith see her off, not her parents, implying they were already dead. If true, that in turn means that Spike must be younger than Apple Bloom. Both have chores assisting an older pony in their work, but Apple Bloom is frequently shown playing or attending school, while Spike almost never is. His life appears to consist near-entirely of serving as Twilight’s assistant, which is particularly disturbing given that she appears to be the closest thing he has to a mother-figure. Spike’s default mode of relating to ponies, as well as his default method to express affection, is service. The show depicts this repeatedly in his crush on Rarity, we expresses by giving her gifts or assisting her in digging up gems. So it is not surprising that the moral code he creates, or at least the part we get to see, is constructed on concepts of debt and service. 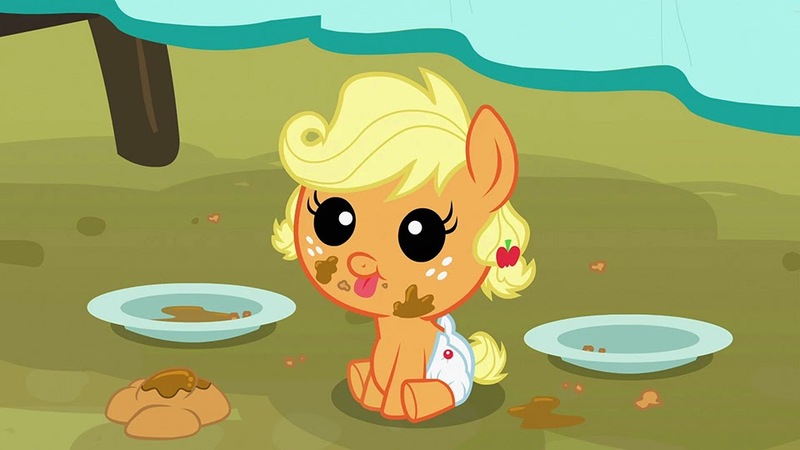 He owes Applejack his life after she rescues him; therefore he must give her that life in the form of service. Where his code falls is in failing to recognize that Applejack doesn’t want that service. She is uncomfortable with it from the start, but Spike ignores her concerns and blithely begins “helping.” Applejack, by contrast, finds herself trapped because she doesn’t want to hurt Spike’s feelings by pointing out how counterproductive his attempts to help are or how uncomfortable she is with the whole idea of keeping what amounts to a slave. Her feelings are trampled on, in other words, because she refuses to trample on his. Spike, however, is overjoyed to work for her, since he is demonstrating that, despite being a dragon, he is still a moral being and a member of her society. Spike has constructed a deontological ethic, which is to say one based on a list of a priori (a term in philosophy that means, roughly, “prejudice I don’t want to examine”) rules. This is in stark contrast to the show’s usual depiction of correct behavior, which is generally mostly a virtue ethic (that is, based on cultivating certain virtues, such as honesty, loyalty, friendship, and harmony) with some admixture of consequentialism (that is, an ethic based on doing what produces good consequences, such as avoiding harm to others). His behavior is thus naturally found wanting by the show, as any rigid adherence to a single meta-ethical approach will inevitably result in behavior that violates the standards of the other approaches. In Spike’s case, that means forcing Applejack to put up with the negative consequences of Spike’s morals, because her own morals initially prevent her from stopping him. There is a tendency, particularly among proponents of deontology, but also just in the culture generally, to treat morality as a non-negotiable, a priori fact over which individuals have no control. “I have to do it,” we say, “it would be wrong not to.” Which is nonsense on two fronts: First, most people do things they believe are wrong all the time. Second, a moral schema is itself a choice. It may be an active choice–a deliberate decision to adopt a particular philosophy or religion, for instance, or even constructing one’s own morality as Spike does–or a passive choice not to examine or modify the morals with which one was raised, but it remains a choice. It follows, therefore, that a person bears moral responsibility for their choice of moral schema, and “My morality told me to do it,” is not an adequate response to criticism of one’s actions. This is an important point for the show to address, because the argument in favor of maintaining our culture’s gender norms is usually couched as a moral position, that it is a priori wrong for people to behave in ways contrary to those norms. Such arguments (especially when they are couched in religious terms) tend to be treated with kid gloves, as if the people making such arguments are not responsible for the suffering they create by imposing their morality on others, because they are regarded as somehow not being responsible for their morality. In the end, Spike stops trying to impose his code on Applejack. He recognizes that while it is fine to let his morality drive his behavior–hence resuming his role as Twilight’s assistant at the end of the episode–he does not want to be the kind of person who imposes himself on others when he’s not wanted. His deontology, in other words, has been tempered with consequentialist and especially virtue-ethical elements. Maybe there is hope for him after all. …Or maybe two episodes from now he will abandon morality entirely and spend an entire episode acting out of pure selfishness. The Kickstarter is very nearly over, and still has $45 to go as of this writing! There is a serious chance Volume 2 could not happen! If you haven’t already donated, please think about doing so–and if you know anyone who might be interested, please point them at the Kickstarter! It’s December 15, 2012. The top song is Rihanna’s “Diamonds” one last time, and the top movie is The Hobbit: An Unexpected Journey, a mess of padding and poor pacing that cannot decide whether it wants to be a faithful adaptation or an Epic Fantasy of Epic Epicness, and thus fails to be either. In the news, McKeeva Bush, the Premiere of the Cayman islands, is arrested for fraud as part of a corruption investigation; the British government pays 2.2 million pounds to the family of Sami al-Saadi, who, along with his wife and children, was kidnapped by MI-6 and sent to Libya to be tortured; and a shooter kills 28 people at Sandy Hook Elementary School, including 20 children and himself. It is, it seems, a day for confronting one’s own darkness, and in its own small way, Friendship Is Magic does the same–with, of all things, a Top Gun homage. “Wonderbolts Academy,” written by Merriwether Williams and directed by Jayson Thiessen, is largely about Rainbow Dash testing her limits, or, rather, having those limits tested by the (thus far) one-shot character Lightning Dust. Of course, there isn’t much difference between Rainbow Dash pushing her limits and Lightning Dust doing so, as Lightning Dust effectively is Rainbow Dash. She is brash, bold, fast, prone to showing off, self-confident to the point of arrogance, brave to the point of recklessness, even colored similarly, with a lightning-bolt cutie mark and a glowing trail when she flies. The only real difference is that she lacks Rainbow Dash’s tendency to complacency and laziness, making her recklessness all the more dangerous. Lightning Dust goes straight to the over-the-top, slightly violent solutions to all the problems she and Rainbow Dash face in this episode, while Rainbow Dash finds herself in the unusual role of playing the voice of reason. The episode thus fits into a general pattern of episodes (of which “Read It and Weep” is the most obvious example) of Rainbow Dash being forced outside her normal behavior patterns and reluctantly growing as a consequence. In this case, however, it is not immediately obvious how Rainbow Dash has grown, unless one recognizes that Lightning Dust stirring up a tornado to clear the skies, and thereby unknowingly seriously endangering Rainbow Dash’s friends, is precisely equivalent to Rainbow Dash kicking a dragon in the face, causing it to attack her friends. Lightning Dust, in other words, is pre-“Mysterious Mare-Do-Well” Rainbow Dash, utterly unconcerned about the possibility of collateral damage from her actions. She is all of Rainbow Dash’s competitiveness and callousness, handily externalized so that Rainbow Dash can confront and try to restrain her. She is, in short, an instance of the Jungian Shadow, the externalized representation of everything an individual tries to deny about themselves. Of course, it is the nature of the Shadow that, as a part of the self and an expression of internal conflict, it cannot be defeated by confronting it directly. Conflicting with the Shadow will always ultimately result in strengthening it, and so it is only by surrendering that Rainbow Dash defeats Lightning Dust. It is only when Rainbow Dash–who began the episode by saying that she would never quit–announces that she is quitting the Wonderbolts Academy that Lightning Dust is defeated. Rainbow Dash is unwilling to pursue her greatest dream if it means risking the well-being of her friends; this is an act of extreme loyalty, and Rainbow Dash’s reward for choosing her true essence, her Element, over her ambition is to be allowed to continue pursuing her dream. Lightning Dust, meanwhile, whose only crime is being exactly like the Rainbow Dash we first met at the beginning of the series, is driven away in disgrace, forbidden to chase that same dream. It seems excessively harsh–until, again, we remember that as the Shadow she is a part of Rainbow Dash, and as Rainbow Dash’s past self we already know that she will go on to play at being a superhero, learn some humility (through, admittedly, some truly awful treatment at the hands of her friends), discover the joys of reading, and then return to the Academy to confront her own past self. We know this will happen, because it has already happened. For Rainbow Dash, this episode is an exorcism and a maturation. Lightning Dust did exactly what the Academy instructor expected her to do, and pushed Rainbow Dash into discovering where her limits are. For the series, this season has served much the same function. Two episodes in the first half of the season, “The Crystal Empire” and “One Bad Apple,” can be regarded as failures, and both fail because they are trying to do things that simply cannot be done within the confines of a cartoon that sells toys to small children. The back half of the season, meanwhile, contains the worst four-episode run in the series to date, and follows it with the most divisive episode of the series. Within this run, however, are clear signs of ambition, including the first real experiments at something like real continuity–not just something like the Gala, which had a few vague references followed by an episode where it happened, but rather one episode which relies entirely on the Season 2 premiere to make sense, followed by two episodes that actually occur simultaneously, allowing numerous references between them. Most experiments fail, after all. The entire point of experimentation is to create instructive failures and learn from them, and that is what the back half of this season will be. A series of failures, encountering and accepting the series’ limitations, but in turn opening the door to a new direction for the series which will enrich and enliven Season 4. But first, it will be necessary to slog through all those failed experiments. At least there’s one episode left before they start! Next week: A guest post, because I’ll be at a con. Week after that, Applejack. Yay.